Hi, my name is Incas although you don't know me, for we never had the chance to meet. I am an American just like you, as a matter of fact I was here before most of you. Now watch through my eyes as my story unfolds. As the settlers moved through America in search of new homes and places to inhabit. And yes, there was always that quest for riches, treasures, and gold. Was I not of any value? The settlers built homes out of my home. My hollow tree nesting sites were cast aside, and the trees I loved so to visit with other friends were cut down and used to build human things. As my fellow Carolina Parakeets saw the humans plant good things to eat. We thought it might not be so bad, but we soon learned they didn't mean to share. I ended up in a zoo with a few friends (other Carolina Parakeets like myself), some humans came to see me, a little girl used to talk to me. She was very kind, perhaps you knew her too, or of her. She could have been your Great, Great Grandmother. She was soon my only friend as those that where housed with me, were no more. She knew my name was "Incas", and I knew hers to be "Ida." Ida's father used to tell her not to touch me, because I might bite. Ida would sneak and scratch my head anyway. It felt so good on my new out coming (pin feathers) feathers, that I couldn't reach myself. In the fall I used to get in the maple tree. My plumage being the colors of yellow, gold, orange, and green blended so well with the autumn leaves, that I couldn't be seen. Ida used to get mad at me, because she thought I too might have perished and been gone like the other Carolina Parakeets whom once shared my place at the zoo. Ida would call to me. Having no flock of my own, I would shriek with joy when I saw Ida, she was my flock now. The last time I saw Ida, she brought me berries, and I loved these. This time Ida whimpered as she said good bye, this was odd to me since she always said good bye before, and it was always until the next time her father would bring her to the zoo. At the moment I didn't understand, but soon learned she was moving away. As time passed I missed her so, but was glad to no not all humans were bad. At least not my Ida, and she always told me, Incas you are a "good bird" too!, "pretty bird Incas." I longed to hear a familiar shriek, a cry, or feel the feathers lightly brush against me of the one whom used to fly by my side. With the warm sun beating down on me, I dreamed of cockle-burrs, and playing down by the bayou before I lived at the zoo. I had thoughts of home and my many friends, when we would land on a field I've heard the farmers say we looked like flowers in bloom. I often think of Ida and where she maybe now, and memories of times gone past. Incas, the Carolina Parakeet, and her kind were the only species of parrot native to the eastern part of the United States. Yes, you heard right an American like you and me. Incas as she was called was the last none Carolina Parakeet, her life ended on February 21, 1918 at the Cincinnati Zoo. The last known sighting in the wild is believed to be in 1904, where a fruit farmer Wirt Remsburg, mistook a Carolina Parakeet for a chicken hawk and shot it. 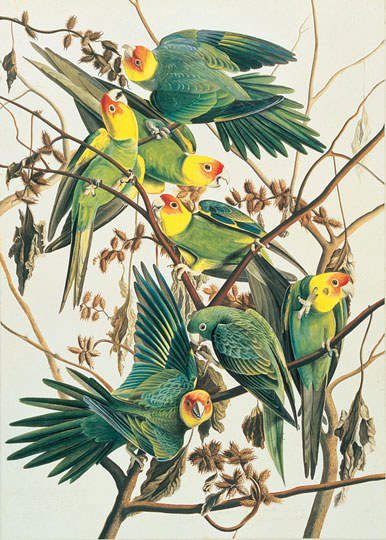 The American Ornithologists Union then declared the Carolina Parakeet extinct in 1939. Loss of habitat, and mankind slaughtering the birds as pests is what lead to there destruction. They once roosted in flocks containing hundreds, across Missouri and Kansas, as well as South Carolina, Georgia, Florida, Alabama, Louisiana, and up the Mississippi to Kentucky. North to the southern shores of the Great Lakes from western New York to southern Wisconsin and to eastern Colorado, southern Nebraska, and possibly to South and North Dakota. Their existence is quite sketchy and not a lot was known of how exactly they came to be totally extinct. There is even speculation of honey bees driving them out of there nesting sights, which were most often hollow logs. C. c carolinensis (soon to be pictured) and we do know that there was a subspecies C. c. ludovicianus (not pictured). We don't know for sure how long the incubation was, but do know each hen laid two eggs, curiously enough often all in the same tree hollow, that the flock would all try to pile in to roost, those that didn't fit would hang on the out side for the evening. I'm not sure how all that worked, but if you think about it they were very successful at raising young, or there wouldn't have been so many hundreds of them all over. I wonder if it was a group effort similar to Quaker parrots, where they all pitched in to help raise the young. There length was about 14 inches, wing spread of 22 inches, the young were easily distinguished by there lack of color, basically green in color. They loved cockle-bur bushes, and would crack the cockle-bur's open and eat. Soon they learned the new human settlers planted grain and fruit trees, which they reacted havoc on. Most noted for wasting food dropping fruit to the ground only to go for another, and one sitting was not enough they returned to there feast over and over until most everything was stripped of the branches. This did not sit well with the farmers and planters. Some of this I wrote from memory of studies in biology I took in school, and was surprised to learn some of our own club members never knew of the existence of the Carolina Parakeet. Thinking this might be of interest to them and others, at least I hope so. These birds actually could have flown over head where you are right now at this moment, imagine that! Look up the next time you see a very large flock of birds, and visualize little "Incas" and the other Carolina Parakeets how awesome that must have been. While researching the Carolina Parakeet I learned through old folk lore that once one was shot (but not dead) it would scream to the flock that would then circle and return again, and again. Then the farmer would have a second, third, and so on chance to take more of them out of civilization. This saddened me in one way and in another I thought how loyal they were to each other. What magnificent creatures they must have been, so sad was there extinction. 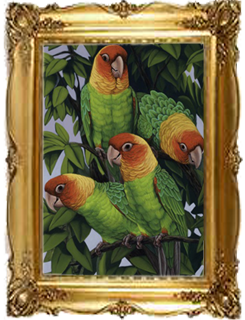 I found some writings that referred to them as conures, I'm sure you would agree with how much they truly do resemble many of the conures we know of today. The saddest part was that they were American, and were here before most of our ancestors came to America and shoved them right out of existence. As a small child I once heard my Grandmother speak of her mother (my Great Grandmother) telling her about these beautiful birds that were often kept as pets. As I was small then, and didn't pay the attention I now wished I had. I missed out on probably some very interesting first hand knowledge. It was about the time I got my very first little American budgie, how I envy the child that may have had a Carolina Parakeet as a pet. Thinking back about my little blue budgie I wouldn't have traded him for the world. That's probably how the children whom had a Carolina Parakeet felt as well. Longing to have what we no longer could have any way (that being very sad) should make us more aware of our surroundings and what we have today. Lets work on preserving these things before they are history too. I'm looking forward to the species we haven't discovered yet. And the next new mutation that's just around the corner. Incas is a short story written by Lisa Sweet meant to inspire children with a better understanding of animals in their environment and how important it is to preserve for generations to come, it was written about the now extinct Carolina Parakeet and Lisa's Great Grandmother, whom had a great affection for animals and music. Lisa's hopes were for a child to envision the life of a wonderfully magnificent creature through it's own eyes and perhaps inspire a child to conserve one of the gems mother earth has provided as all gods creatures have feeling and should mean something too. Lisa chose the color rose to depict rose colored glasses so to speak, in other words lets see things for what they are and value them now for tomorrow they could be gone.